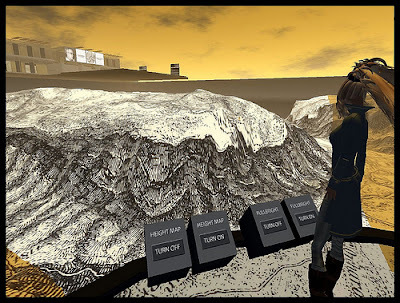 There's a new place on the grid that is so lovingly rendered and detailed, so flawlessly planned and scripted, and so very pleasing to the eye, that it is a credit not only to the people behind it but to virtual worlds, as well. David Rumsey has a Master of Fine Arts degree from Yale University and was a founding member of Yale Research Associates in the Arts. He has been an Associate Director of the American Society for Eastern Arts in San Francisco, a lecturer in art at the Yale Art School for several years, and a real estate developer. And then... around 1983, he began to collect maps. The fact that he has been living in the Bay Area comes as no surprise to me. As a book collector myself, I can tell you that many of the best rare books and ephemera stores in the world are found in that vicinity. Today, and 150,000 historical maps later, David Rumsey Maps is one of the largest private map collections in the United States. Mostly, he has focused on cartography of the world of the 18th and 19th Centuries, but he has also gathered atlases, globes and maritime charts of Oceania, the America, Asia and Europe. 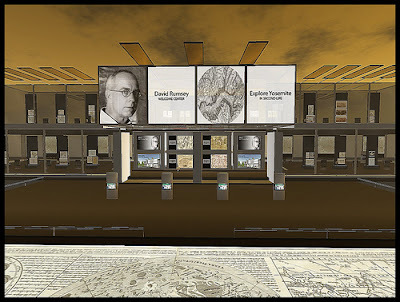 In 1997, David turned to Cartography Associates to digitize his collection... and ten years later, he entered Second Life using an avatar by the name of Map Darwin (rez: 11/13/2007), and began seeking a way to translate his treasures on the 3D Internet. Meanwhile, Nathan Babcock (rez: 5/5/2006) is an associate creative director at Centric, an advertising agency based in Los Angeles with offices in New York, Shanghai, Tokyo and notably, Second Life, that has positioned itself as an Agency of Change. 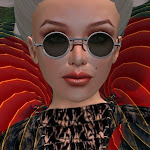 David Rumsey approached Centric to bring his collection to life, and now that relationship has changed the map of Second Life. 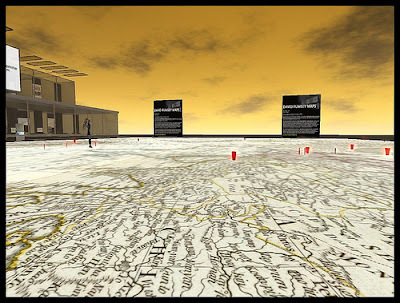 Nathan became the creative lead for David Rumsey Maps, and three months later a four sim wonder was completed that will open officially to the public on March 6, 2008 (teleport directly from here). Nathan Babcock: The sculpty is the crown of the estate; it's not simply a hand sculpt. 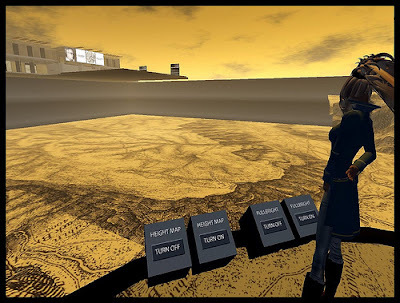 What you see is actual real life topography data brought inworld, so the map is true to scale. If your avatar is 3 inches tall, Yosemite is 1:1 scale. 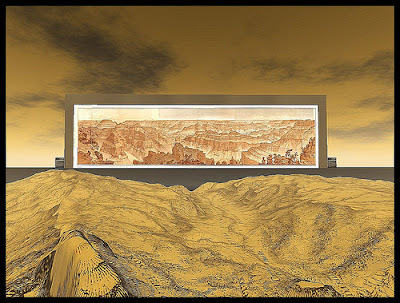 Here you see a framed illustration of the Grand Canyon in the distance. Nathan Babcock: David Rumsey is a philanthropist and map collector. 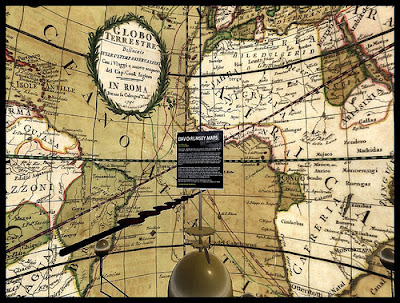 He wants to educate people on the history of maps and seeing what the world, or cities looked like through time. Topography is ever changing, and maps serve as historical snapshots. Bettina Tizzy: Does he come in world ever? Nathan Babcock: He does. He loves SL and will be giving a speech on the launch date. His maps are featured in Google Earth and Google Sky, and (he) does talks amongst the academic crowds all the time including Harvard. When you visit, be sure to max out your draw distance (Preferences> graphics> Draw Distance> 512 - and don't forget to set it back to about 120 before you leave!). You will notice that the entire region (actually four sims) is covered in a map terrain of Yosemite Valley dating back to 1883. 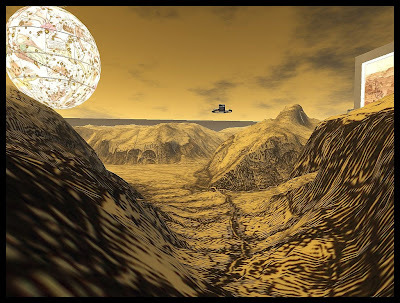 The terrain elevation is "real terrain" brought into Second Life by utilizing real topography height elevation models. In essence you are really flying through Yosemite. "This is one of the earliest detailed surveys of Yosemite Valley in the Sierra Nevada Mountains of California. The map shows interesting cultural features in the valley, many of which no longer exist. The steep valley cliffs are shown with a map style of the 19th century called hachuring - closely spaced lines to indicate slope." 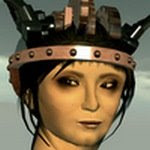 Fly to the center of the estate where you will find a circle platform and wait to rez everything completely. Try clicking on "Height Map" to see the map of that quadrant represented as a flat map. Then click "Fullbright," to set the bright effects, and alpha effects of each sim. 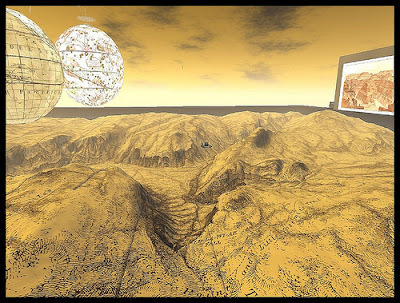 Due NW on the estate, you will see two colossal globes in the distance (thank you, huge prims). 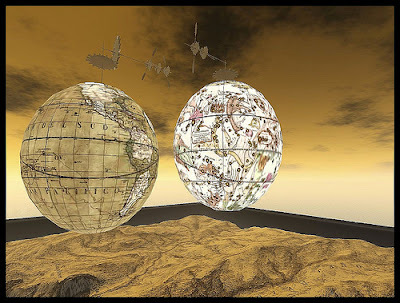 The first is the Globo Terrestre or World Globe dating back to 1790, by Giovanni Maria Cassini, that shows contemporary discoveries in the Pacific as well as the routes of three of Captain James Cook's voyages. Per the accompanying notecard: "Giovanni Maria Cassini was an important Italian engraver and painter based in Rome. In addition to producing globes and maps, he issued many engravings of landscapes and architectural views which were popular in his time. He was a member of the ancient Catholic religious order, Clerici Regulares de Somasca (C.R.S. ), whose initials follow his name in the title of the Celestial Globe. Cassini was born in 1745 and died circa 1824." This photograph taken from inside the globe. 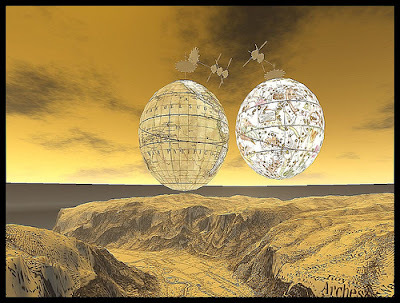 The globe furthest away, in a corner, is the Globo Celeste or Celestial Globe, dating back to 1792 and also created by Giovanni Maria Cassini. 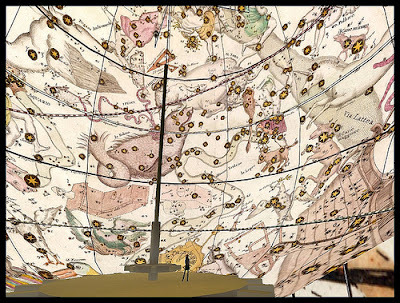 Per the accompanying notecard: "The globe features a particularly decorative projection of the heavens with the constellations shown in their classical forms. The celestial globe is based on the astronomical observations of Flamsteed and Lacaille. Ptolemaic and later constellations are shown. Stars are illustrated at various sizes depending on their magnitude. The heavens are shown as they would be seen by an observer looking from the center of the earth." Head back to the gift shop area (great freebies, by the way) and teleport up to see the topographical map of the city and streets of Old New York, dating back to 1836, by J.H. Coton. 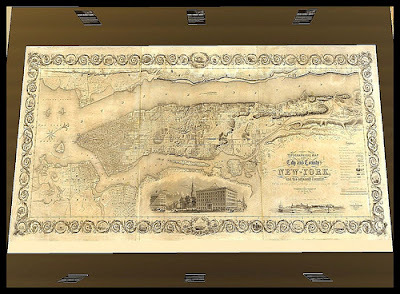 Per the accompanying notecard: "Anson Stokes, an authority on the mapping of New York, said "This is one of the most beautiful nineteenth century plans or maps of Manhattan Island, and is full of interesting information. It is perhaps the last example of really artistic map-making, as applied to Manhattan Island." Central Park did not exist when this map was made, and most of Manhattan Island north of 42nd Street is shown as streams, woods, hills, fields, and farms." Come back down and discover and claim your spot on the map of the world that enables a push-pin annotation of where you live along with a short blurb about it. Is it bad that I'm sitting here squeeing with excitement to go see this? I may have Monday off, and if so, will take a couple of hours to go explore.